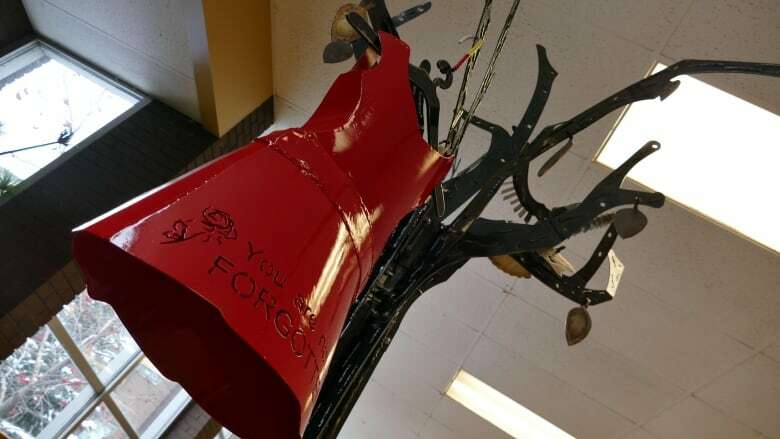 Two Grade 12 students are using metal as their medium to raise awareness about missing and murdered Indigenous women and girls. Trinity Harry and Joseph Ginter spent more than 300 hours welding a red dress hanging from a tree at R.B. Russell Vocational School. "I do it because people don't really know what some girls have to worry about every single day," said 17-year-old Harry. "People missing their relatives, their moms, their sisters, their kids. It's sad and something that shouldn't even be going on." Harry and Ginter said the red dress represents MMIWG, a symbol created by Winnipeg artist Jaime Black through her REDress Project. The students put their own spin on Black's project, incorporating elements of their culture into the tree's design. "We made seven branches, they go together, the seven pieces represent the seven teachings," said Harry. "On the branches we have leaves with the provinces where girls have gone missing." Ginter said making the leaves was his favourite part, because each required extra steps to create the details which make the leaves look weathered and golden. 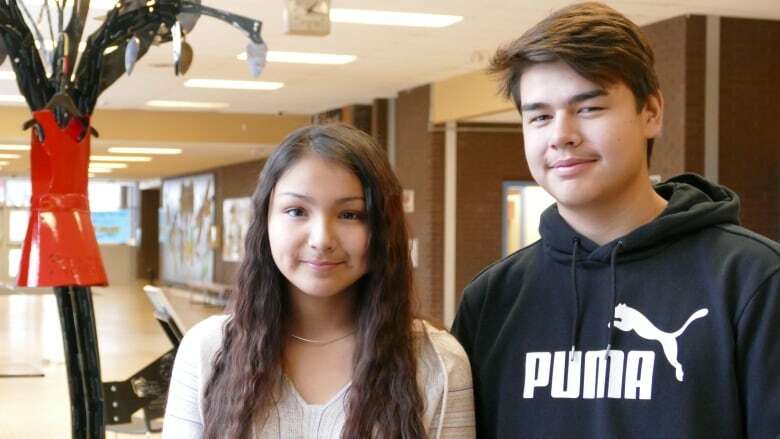 Both students plan to go Red River College next year after they graduate, to pursue a career in welding. "It's hands-on, it's not sitting at a desk all day. It's strategy," said Ginter, who is about to turn 17. The tree was their first welding contract, commissioned by LNG Canada, a joint venture between Shell, PETRONAS, PetroChina, Mitsubishi and KOGAS. Ginter and Harry were invited to the LNG headquarters in Kitimat, British Columbia, where the project is based, to teach welding to other students. 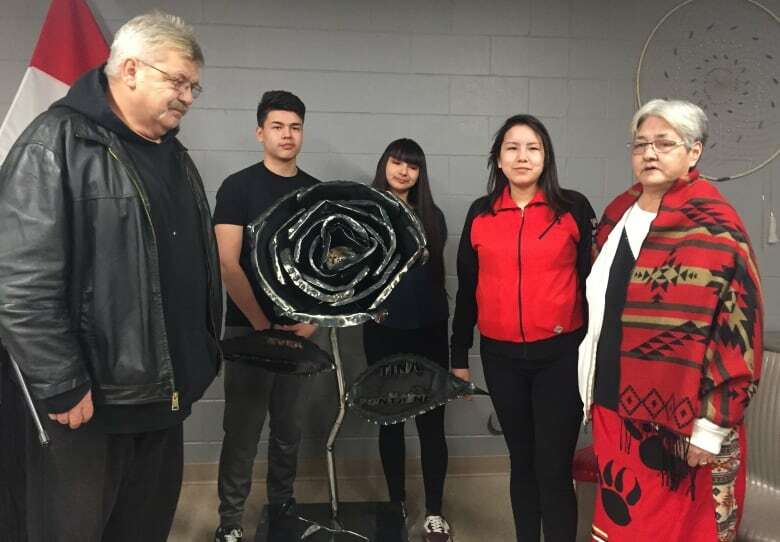 LNG took notice of them because of a rose they welded in 2017, in honour of Tina Fontaine. The sculpture is now a permanent fixture at Tina's Safe Haven, a 24/7 drop-in centre in her name, on Selkirk Avenue. But first, they took the rose with them to B.C. "[LNG] asked if they could keep the rose, but we didn't want to give them the same rose," said Harry. "Because it kind of loses [its] purpose a bit, it's supposed to be just one for her." 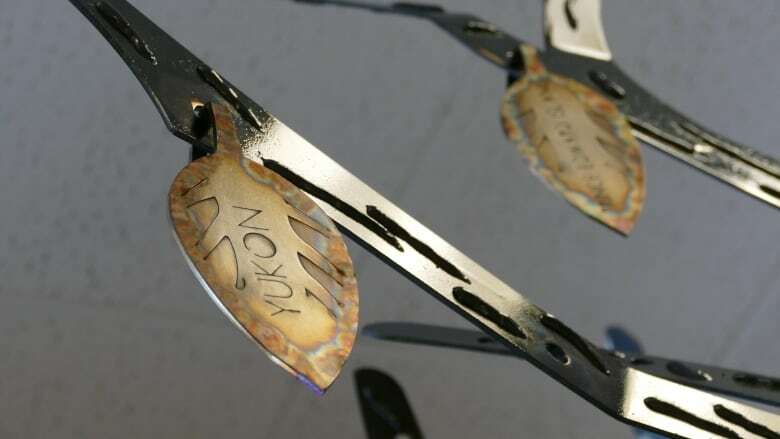 This fall they hit the drawing board to come up with a second sculpture which honours MMIWG specifically for LNG, which will be displayed in the the entrance of its B.C. office. The students hope it will inspire a conversation about MMIWG, they say, especially within a male-dominated industry.